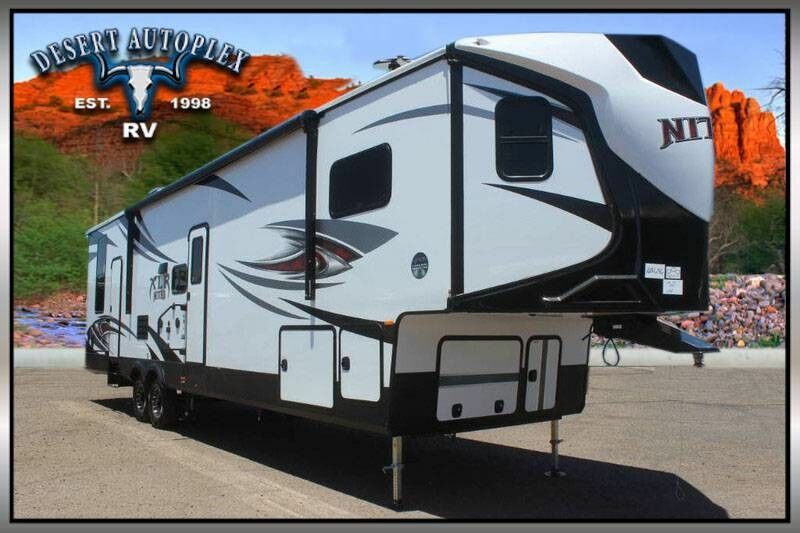 This awesome toy hauler is sure to impress, please review the information provided and call our professional sales team toll free at 1.888.385.1122 today! Gel coat fiberglass radius cap, Radiant foil barrier, 7,000 lb. E-Z Lube Dexter Axles, 16" E-rated tires, Nitro filled radial tires, 5/8" Plywood floor decking, Fully enclosed underbelly, Holding tanks secured by frame cradle, 3" Wood floor joists with fiberglass insulation (Most models), Slam latch compartment doors, High gloss fiberglass exterior, Laminated and insulated slide out end walls/roof, 1" Garage floor decking with rubberized flooring, 8 Ft. easy lift, 3,000 lb. ramp door, One piece rubber roof, 13,500 BTU air conditioner, Rear electric stabilizer jacks, Steel anchor plates for 5,000 lb. tie downs, High efficiency A/C duct system, Vacuum bonded sidewall with block foam insulation, 3/8" Roof decking, Fiberglass insulation plus radiant foil barrier, Attic vents, 102" Widebody construction, Full walk on roof, 2" Aluminum framed sidewalls, and more! Aluminum Framed Laminated Sidewalls, 102" Wide Body Construction, Powder Coated Steel I-Beam Chassis, One Piece Rubber Roof, Two Tone Partial Painted Front Cap, Large Entry Assist Grab Handle, EZ-Lube Dexter Axles, Marine Grade Speakers, Huge Tinted Safety Glass Windows, 18K Hitch Pin, Collapsible Exterior Ladder, Black Tank Flush, Full Walk-on Roof, Rain Gutter Drip Spouts, LED Exterior Lighting, Radial Tires with Nitrofill, Satellite Prep Main TV, Hot and Cold Spray Port, and more! LED Interior Lighting, Full Height Ceilings, Plywood Decking, Beauflor Tile Pattern Flooring, Shaker Style Cabinetry, Full Extension Ball Bearing Drawer Guides, Brushed Nickel Hardware, AM/FM/Bluetooth Stereo, Stainless Steel Galley Sink, Large LCD Living Room TV, 35K BTU Furnace, 12V Battery Disconnect, Ducted A/C and Heat Throughout, Gas/Electric Water Heater, 5,000# Steel Reinforced Tie Downs, and more! BIG AIR PACKAGE- 13.5K Ducted A/C, Spare Tire, Blackout Features, Aluminum Wheels, Premium Graphics, Fiberglass Caps, Electric Stabilizing Jacks, Power Recliners with USB Chargers, Upgraded TT Furniture, Stainless Steel Appliances, Enclosed Underbelly, Solar Charger Input, Night Shades, Hid-N-Screen, Wainscoting in Garage, Hidden Hinges on Cabinetry, Shaker Style Passage Doors, Radiant Roof, Floor, Slide Out Floor, Garage Floor, Dual Front Insulation, 50AMP Service & Gen Box. N.O.S.  PACKAGE - LG Solid Surface Kitchen Countertop, N.O.S. Red Light Under Entry Steps, Rear Vision Camera Pre-wire, Key Alike - Single Key Lock System, MORryde Zero G Ramp Door, MORryde CRE Suspension Enhancement System, MaxxAir Power Roof Vent Bathroom, Red LED Exterior Marine Grade Speakers, Upgraded Electric Awning with LED Lighting, Solid Step Main Entry, Main Entry Door Friction Hinge with Window and Upgraded Assist Close Screen Door. OFF THE GRID PACKAGE - 5.5kw Onan generator, generator prep, mobile fuel station. 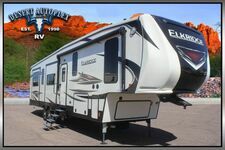 This 2019 Forest River XLR Nitro 35VL5 Double Slide Fifth Wheel Toy Hauler is absolutely stunning! Financing is always available on approved credit, and we will even walk you through your new purchase upon delivery to show you how everything works if you're not familiar already! Call our professional sales team toll free at 1.888.385.1122 with your best offer, HURRY before it's too late!! !